Of course I wasn't done racing for the year, of course I wasn't! 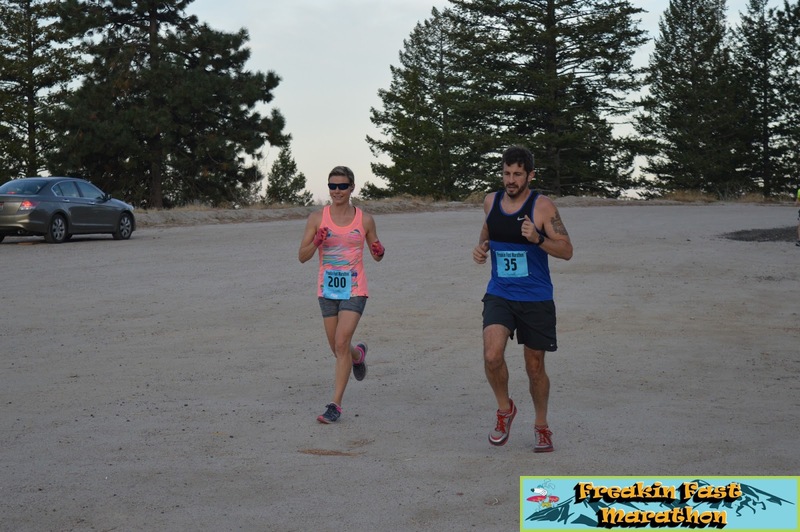 A mere 6-days after racing in the City of Trees Marathon, I competed in yet another marathon—the Freakin' Fast Marathon! Similarly to the City of Trees, I hadn't intended to run this race, but the day after signing up for City of Trees (three weeks ago), I was asked to run the Freakin' Fast. Oh man, the thought of two marathons in less than one week's time? No way, dude! While I initially said no—considering that I hadn't trained and adding not one but two marathons sounded super daunting—I changed my mind this last week in a "runner's high" moment and said once more, "Why not?!" The Freakin' Fast Marathon is known as the "second fastest marathon in the world" and is a Boston Marathon qualifying course. 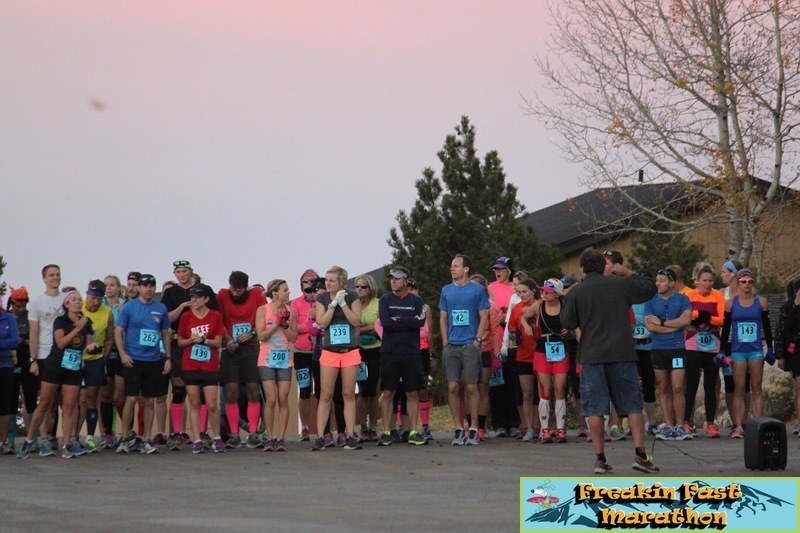 The course begins at the top of Bogus Basin ski mountain and drops over 4,000 feet to the finish at Julia Davis Park in the heart of downtown Boise. The only difference between the Freakin' Fast Half Marathon (which I ran in July) and the full is that the full starts up the hill a little farther and ends in the city. Same great course, same great race directors, same stinkin' crazy runners. To be honest, when thinking back on my experience with the half—in which I placed as the 1st Overall Female with a time of 1:17:23—and the fact that it took me three entire weeks to get my legs back to normal after the intense post-race soreness I experienced, I cannot believe I actually agreed to do this race. 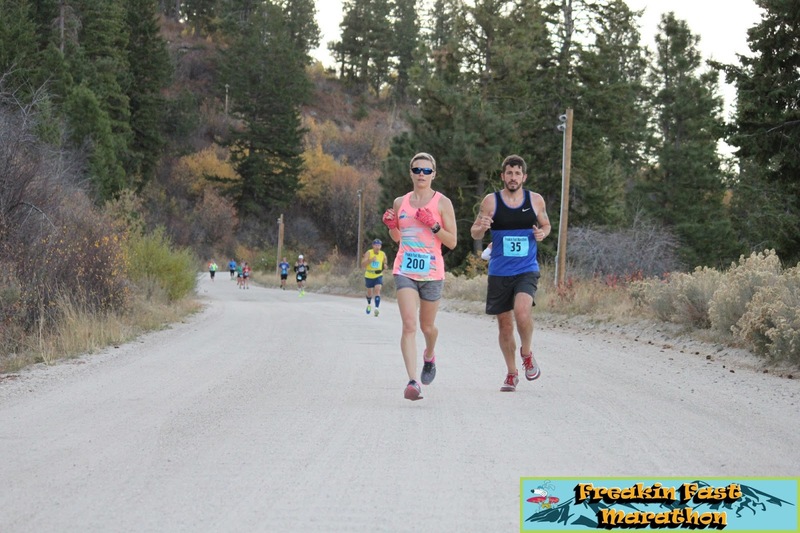 I just re-read my Freakin' Fast Half post, and I surprisingly seem to have left out the insane soreness and recovery time that my body hit me with after that race. Dude. It was a killer. It was one of those, "I will NEVER do anything like this again," kind of races. And yet... there I was, subjecting myself to another bout of torture. The race began at 8:00 am on Saturday morning, and I was sitting on a bus to be hauled up the hill at 6:00 am, oatmeal in my tummy and antsy legs itchin' to get started. When we gathered at the start line, the first thing I noticed was the smaller crowd that usual (about 80 people). The good news was that if I was crazy for doing this race, at least these other folks were crazy enough to do it, too! 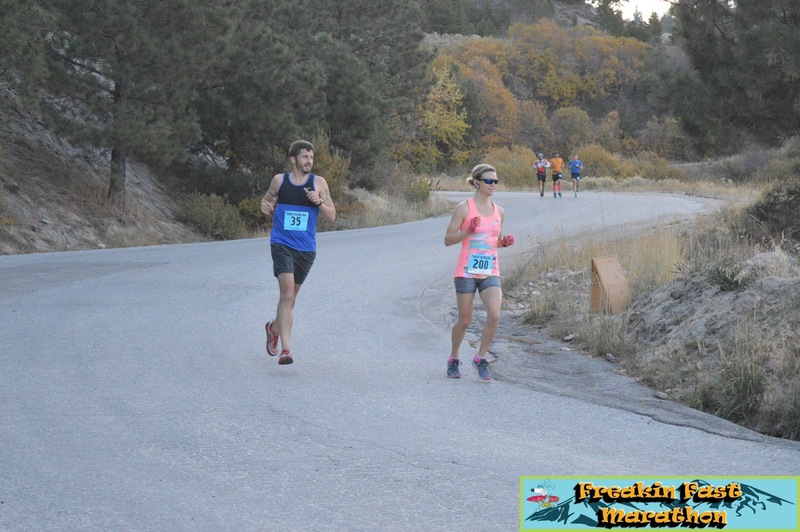 We started running at the honk of a car horn (yeah, Idaho! ), and we were off. The race was so scenic and surprisingly fun! We have a big wildfire going on right now, so I was fortunate that the hazy air and red-air conditions didn't irritate my lungs. 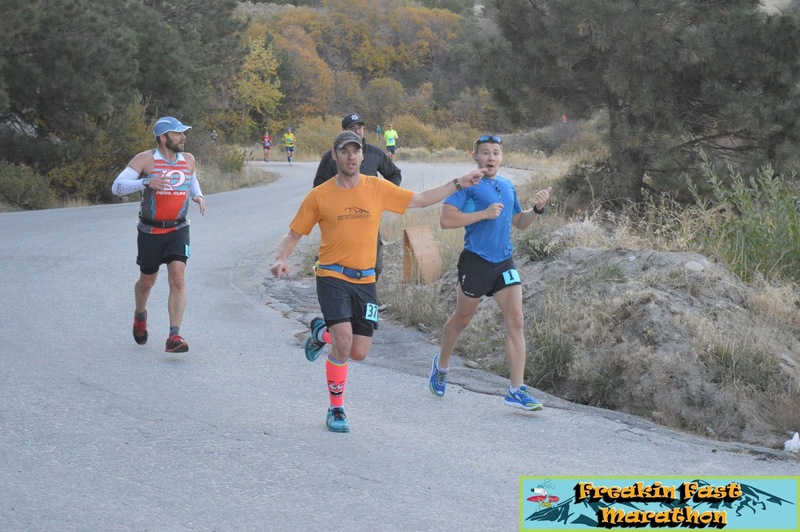 One thing that I did differently with this race was start out a bit slower than I'm used to (about 7:15/mile), to ensure I didn't totally die at the end like I have been doing lately. 7:15-minute miles are actually faster than my usual full marathon pace, but considering the downhill slope of this race and the fact that my last race on this course was a 5:54/mile average—this was taking it easy. To ensure I kept this pace, I ended up running with a nice guy from Northern Idaho for the first 9-miles. 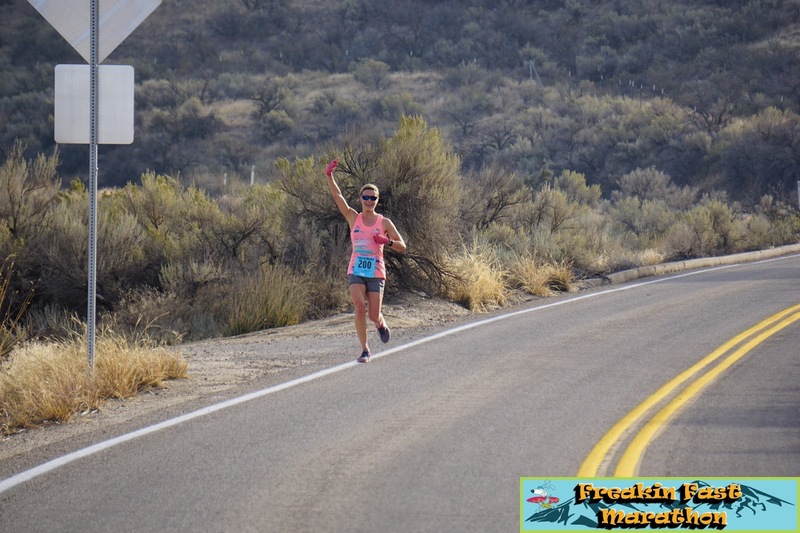 A little worried of pushing it too hard and running two marathons so close together fueled my mantra for this race, which was "God please guide me," and guide me he did! Every time I felt a little twang of pain or something start to tighten, I slowed down. Mentally, that was challenging—but physically, it sure paid off! The course wound down through the foothills with aid stations every few miles. Unlike most of my other races, I made it a point to stop at each aid station for a small sip of water. Staying hydrated definitely helped keep me on a good foot. I was able to make it through the whole race with a very good mental attitude and positive spirits. I had a pretty hard time at the last race after about mile 20, but the soreness and mental fatigue didn't hit me at this race until mile 24—and I was on the home stretch by that point! I will say that running the last six miles on flat terrain after just pounding the downward slopes for 20 miles was rather challenging, but slowing down and taking the first part easier helped out tremendously. When I saw the finish, I began my kick. I was so excited to be done. 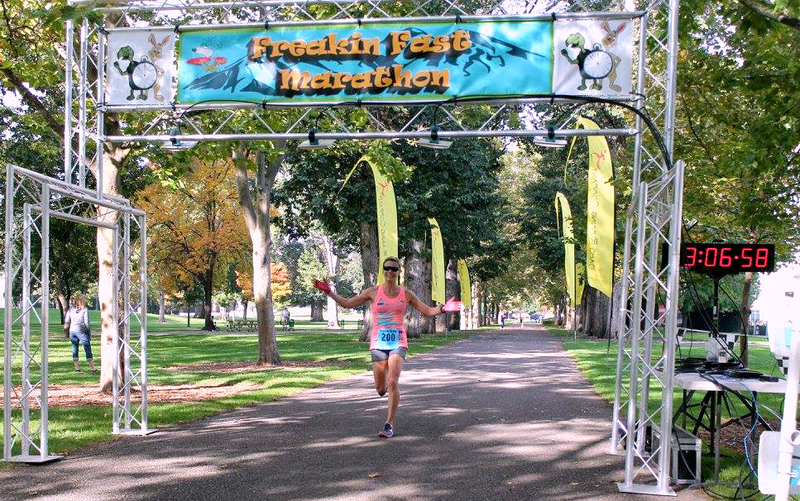 I ended up finishing in 3:06:58 (7:08/mile average) and won 1st Overall Female and finished 7th overall. Woo-hoo! I had just earned another Boston Marathon qualifying time and a new PR by 9-minutes and 45-seconds! I ran straight into Daniel's arms for a huge hug and then straight over to the refreshments table where I snagged a huge cup of candy. A worthy trophy, indeed! See photos of the race below! The cute race shirt and matching bib. Gathered at the start as the sun was coming up and chatting with my friend Tanya. We were ready to run! And we're off! 10-steps in, only 26.2 more to go! Yikes! These guys realized that we, as well as the six people ahead of us, went THE WRONG WAY! Look how concerned they are! And we were too far away for them to stop us! So they did what any respectable runner would do and they went "right,"—the right way! Too bad for us, right? Ha! Fortunately, my new running buddy looked back and noticed these guys heading off in the opposite direction and he let me know. We stopped—dead in our tracks—and looked left (at the first six guys), then right (at everyone else going the right way), and then at each other like "Which way's the right way?" We then realized we had taken a wrong turn so we started running again, frustrated at ourselves and trying to recover the time and distance we had lost. See next caption! Here we are... trying to make up for our little detour. So technically, since I finished 7th overall, I was actually the very first one to finish the entire course as the first six guys missed out on about 1.5-miles of the course. Whoops! But, as they are all men of integrity, they were very quick to tell the race director about the mishap, so while their times may be a little skewed, each ended up running more once they got to the finish to make up for the initial loss. There we are, all smiles as we have finally made up ground and gotten back on the right path! I loved this race because I was so happy during the whole thing! 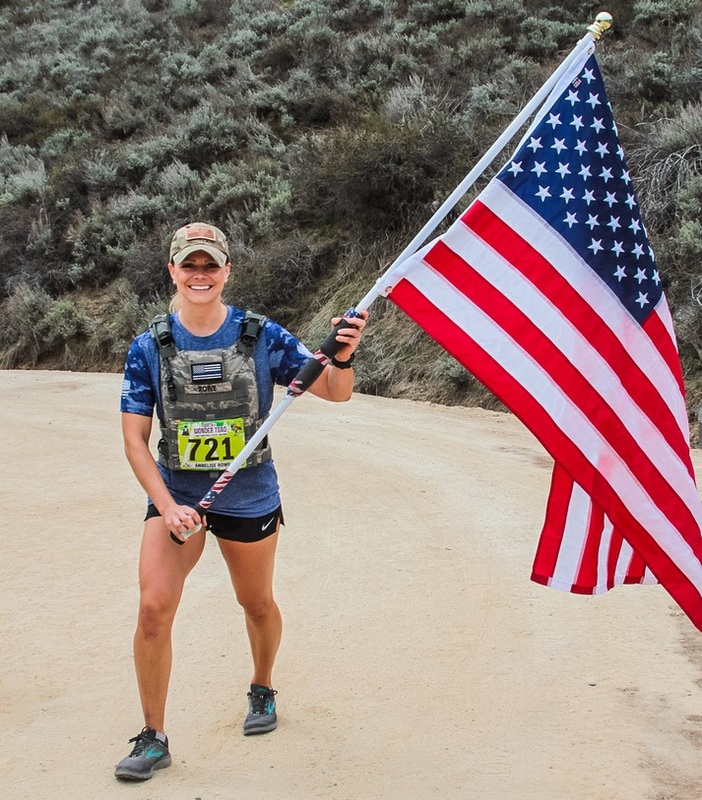 Each race, I set a goal to just feel good during the race with the intention of not trying to pressure myself to take a certain place or run a certain time. And this race—I actually did it! I was all smiles the whole race (well, until mile 24 anyway). As I made a point to stop at almost every aid station, I was thrilled to find that each one had not only water and Gatorade, but also CANDY! I've never been to a race that had candy at every station, and I tried to grab a couple pieces each time I grabbed water so by the end I'd had a few Mike & Ike's, sour gummy worms, and Sour Patch Kids and I have to say—candy is my new absolutely favorite intra-workout re-fueling treat! Carbs are carbs and these ones gave me just the quick-acting sugar I needed! And gosh—isn't that medal great? It's 5.5 inches of awesome... what a reward! The feeling I was experiencing during this photo cannot be explained. If you've run a marathon, you know the feeling. It's not about winning 1st Place Overall Female. It's not about the new PR by almost 10-minutes. It's not about the trophy or the medal or the title. It's about the feeling that you have simply done it—you've pushed your body further and farther than you ever could have imagined. This is literally a photo of my runner's high. I had so much fun connecting with a fellow Boisean and Instagram friend, Mandi after the race. She and I have supported each other via social media for the last few months and I met her at the City of Trees Marathon. She was volunteering at this one so we got to hang out for a bit post-race! I love meeting other local runners! I loved this race for a couple of reasons. 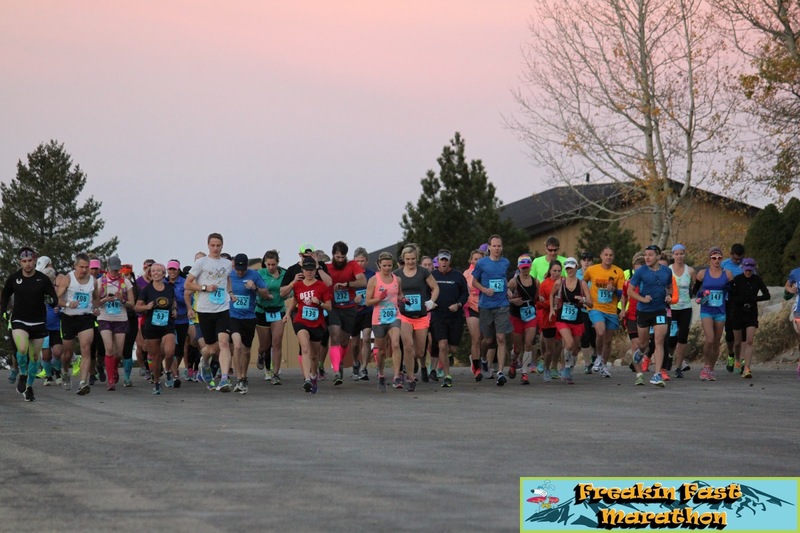 1—It was a beautifully scenic course, offering panoramic views of the entire Treasure Valley for most of the race. 2—The weather was divine... decently sunny, not too hot, and a little breezy. 3—While the downhill wreaked havoc on my legs post-race (I can barely walk today and don't foresee it being an easy task for the next several days), since I paced myself and didn't go as fast as usual, it was a rather comfortable race. 4—The crowd and race directors for this race were so supportive. It's always fun running an extreme race like this one because the people who come out to participate are all as crazy as you are! 5—This race (and I know my husband likes this, too!) should be my last big race of 2015. Yes—I'm finally doing it. I'm going to give my body a much-needed break and—while I still intend on working out daily—I do not have anything big I'm training for so I can just focus on repairing and strengthening over the winter. Speaking of repairing... my legs are beyond shot from this race. Sitting, standing, walking, bending over, even laying down... it all hurts. That "freakin'" run... freakin' fast, freakin' awesome, freakin' glad it's over!